Are you searching for an SMS provider for your application or business? 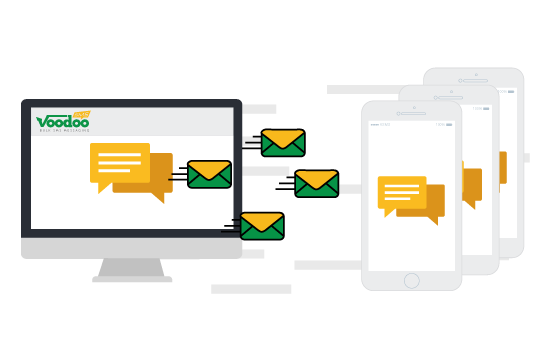 Our SMS platform lets you send marketing text messages and SMS notifications online, receive responses from your target audience and track your campaign's performance indicators. Voodoo SMS is one of the UK's top SMS providers. Our SMS platform is used by a wide range of marketers, businesses and application developers to send and receive targeted SMS online. Whether you need to launch an SMS marketing campaign, deliver SMS alerts and notifications to your customers or application users, or simply keep in touch with your target audience using text messages, we're a reliable SMS provider that can help you achieve your goals. We're one of the UK's top SMS providers. Our system lets you send and receive text messages online using our shortcode number or your long phone number. You can send and receive SMS as single messages or deliver a large-scale SMS marketing campaign to your target audience. Better yet, you can personalise your SMS messages to include the recipient's name, verification code or order number. Our SMS platform is built from the ground up to fulfill the needs of apps, marketers and ecommerce merchants. Starting your campaign is simple. All you need to do is create a free account, import your list of phone numbers and create your first message. You can fund your account with a single SMS or buy credits in bulk to take advantage of our competitive volume-based discount pricing. Sending your SMS message is simple. Our SMS provider platform lets you schedule a message to be broadcast to your entire audience or deliver it in batches to create a flow of responses for your sales team to process. You can also send SMS via email using our email-to-SMS system, which is supported by all mail apps. Your recipient will receive your email message as a text message complete with a custom sender ID. With Voodoo SMS, you can also receive SMS. Our SMS provider system lets you use a custom promotional code with our shortcode number to receive responses from your target audience, or send messages using your existing long phone number. Responses to your SMS are tracked and stored in our system. From there, you can import any response numbers into a separate list for SMS follow-up or pass them on to your sales team for contact via phone, email or any other channel. Our SMS provider API lets you integrate Voodoo SMS with your application, software or CRM system to send out automated text messages. We have a custom built REST API with modules for ecommerce platforms like Magento and OpenCart. Integrating our API with your application is simple. All it takes is a few short lines of code and you're ready to use Voodoo SMS to send personalised SMS messages to your customers and app users via our provider API. You don't need thousands of pounds to start your first campaign with Voodoo SMS. Our system lets you start sending and receiving text messages using our SMS provider with no contracts or minimum quantities. In fact, you can launch your campaign with just one text message. Our volume-based pricing means the more messages you send, the less you pay to send each message. As your campaign's scale increases, you can get fantastic promotional pricing of just 1.74p per message for SMS credits purchased in bulk. As one of the UK's top SMS providers, we're trusted by marketers, app developers and a huge range of businesses to deliver SMS. Create your free Voodoo SMS account now to launch your campaign and start reaching your users, customers and prospects with targeted text messages.